This book. Just wow. I don’t know what it is about WWII stories, but I love them, and this one is no exception. There are so many things that make this a must-read. 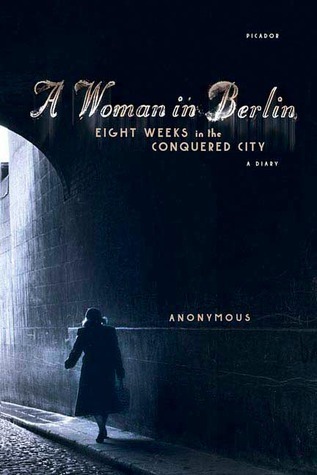 It’s a side that we don’t always see when it comes to WWII literature – this diary takes place in Berlin, from the perspective of a German woman, as the Russians come in. It’s only been in recent years that we’ve really started to hear about the horrible things that happened in Germany, to Germans, because of the war. This gives the reader just one horrifying glimpse. This book is by anonymous. This woman was having a hard time dealing with what she knew would be her fate and started to write it all down. She was some kind of journalist, or in publishing, before and must have found writing comforting. She chronicled her life as the Russian victors came in and took what they wanted – namely the beds of every female. It’s a story about survival. She chose one path to stay alive and she made note of the paths others took. She wrote about what went right and what went wrong, she wrote about being hungry, about not having light, about not being safe, about where life might go. This diary feels like it was written from the soul and it’s amazing that we can all now read it. It’s just such a great, short, chronicle of a horrible time in history. Highly recommend for everyone, but especially anyone who is fascinated with WWII.